Alongside ARKit 2.0, Apple revealed new Animojis alongside new Memoji virtual doppelgangers that compete with functionality quite similar to that of Samsung's AR Emoji. Also, Apple is adding tongue detection to the facial features that the TrueDepth camera on the iPhone X can track. The feature promises to bring some sass to Messages and will be instrumental in faithfully recreating KISS or Miley Cyrus performances in Animoji Karaoke. Animoji can now pick up on a wink of the eye as well. If four new characters aren't enough, iPhone X users can now create their cartoon likeness, called Memoji. Just like with Bitmojis, users can customize their hairstyle and accessories, and the saved Memoji will mimic the user's facial movements just like with Animojis. Animojis are also coming to FaceTime (including group calls), which will also bring group video support, in iOS 12. 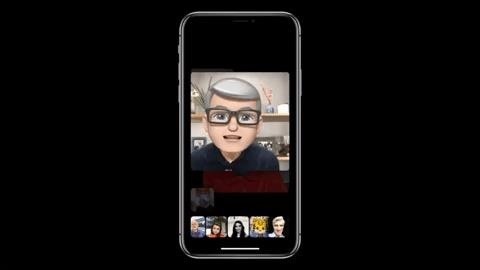 During a live demonstration of a group FaceTime call, Tim Cook showed off his own Memoji. At the risk of editorializing, the Memojis look a lot better than Samsung's AR Emojis. While Samsung may have Disney and Pixar characters at their disposal, Apple's Animoji are almost as instantly recognizable as Mickey Mouse and pals. Maybe they'll get their own spin-off animated series soon? Animoji seems to have a higher priority than ARKit if marketing exposure is any indication, as Apple has taken several more opportunities to make the visual parrots look cool in videos and advertisements. As it stands, Animojis are the face of AR for Apple for the time being.